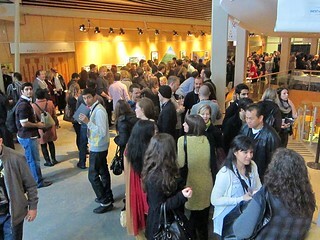 2010 TEDxVancouver: The Fine Line conference at the Kay Meek Centre in West Vancouver on November 27, 2010. 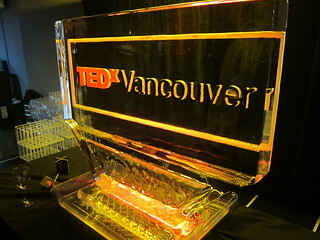 I had an absolutely incredible time at the second annual TEDxVancouver conference with a bunch of friends, particularly Peter Verge, Jordan Kallman, Maurice Li, Jeremy Lim, and Karra Barron. It was a jam-packed day full of fun, interesting, engaging, intense learning and knowledge sharing, making live connections in person. 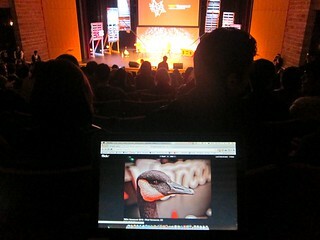 The attendees were a diverse group of deep thinking professionals. 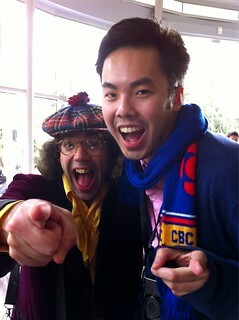 I still cannot believe how many engaging conversations I had, especially with Nardwuar who somehow recognized and knew who I was from my coverage of Grant Lawrence's book launch. We spoke of DIY media and he even tried to persuade me to do a radio show for CiTR. "If you have a dream, make it your goal." 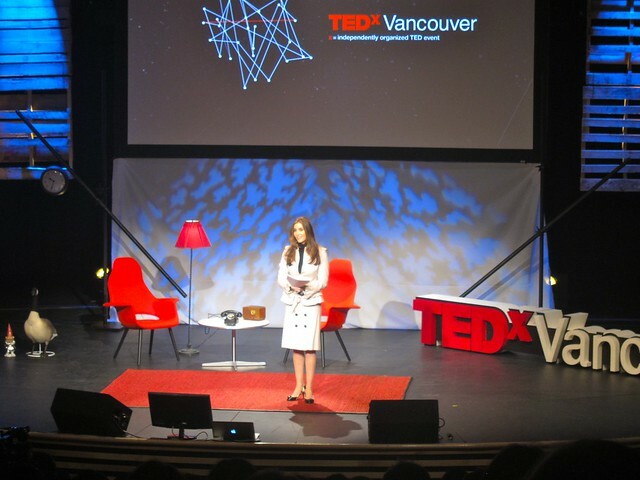 The first speaker of the day was human rights activist, the Iranian-born Canadian Nazanin Afshin-Jam. I must admit, although the speech was very compelling and inspiring, as the first speaker, I found it incredibly depressing and a questionable way to start of the day's events. However, Nazanin was very engaging and her urging for more action against human rights violations in the world was stark and clear. Her call to action for real change was powerful albeit idealistic, calling on us to be the "voices of the voiceless". She had great words to say like how an "ocean of change [can] put out the flames of injustice". "The truth about politics is not to let the truth get in the way." I found Greg Powers speech about storytelling great. He spoke of "the fine line between speaking and being heard" and the three key elements to good storytelling making things irresistible, believable, and unforgettable. Any interesting story has conflict at the centre of it. He elaborated on this with the changing landscape of new media in the context of American politics. Emotional narratives drive a story forward and that shapes news and media coverage. My story + your story = our story. "Our diversity might be what saves the planet." 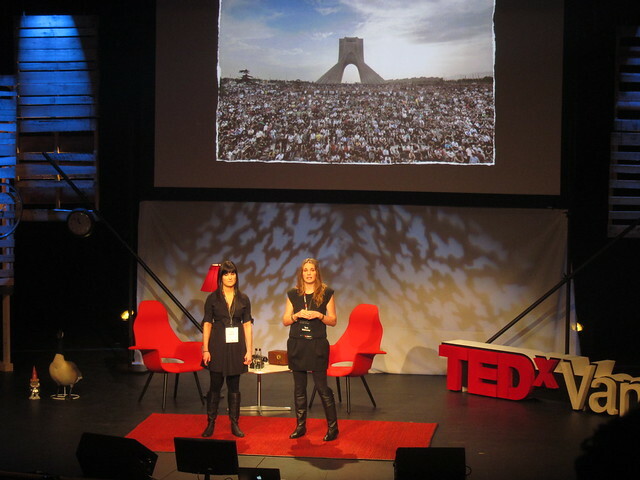 Fiona Rayher and Tara Mahoney of the Generation Why Media Project spoke of Generation Y and its effect on the changing world. Evidently, we are a hero generation that is and will be responsible for saving the world. A hero generation occurs everything four generations and the last one was the G.I. generation (aka "The Greatest Generation") that ended the depression, fought in WWI, landed on the moon, and spread democracy. Fiona and Tara spoke of the importance of optimism in the face of our massive world problems and not to let cynicism poison our collective progress. Today, we have unprecedented collective power as the largest generation ever. We are culturally and socially more diverse and this is the key to our progress. 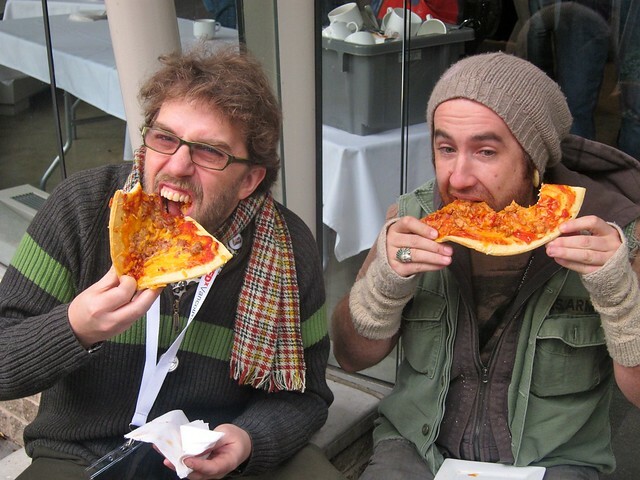 I had some great conversations with the likes of Dave Olsen from HootSuite as well as photographer and event organizer Kris Krüg (pictued above eating pizza) in addition to music writer Mikala T. from Backstage Rider, Ariane Colenrander, Kelsey Dundon, Kimli Welsh, travel journalist Robin Esrock, and many others. The music by Don Alder and rapper Kyprios was impressive. 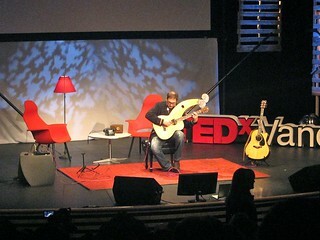 Alder's cool guitar stylings set a vibrant mood in the auditorium, while Kyprios' intense rhymes rocked the crowd. His rap on racism and stereotypes set off a few alarms with its fowl, blunt language that surely rangled some, but its artistic merit and value were clear. At the end of the night, the two collaborated on a rather amusing freestyle guitar and rap jam session that was pretty cool. 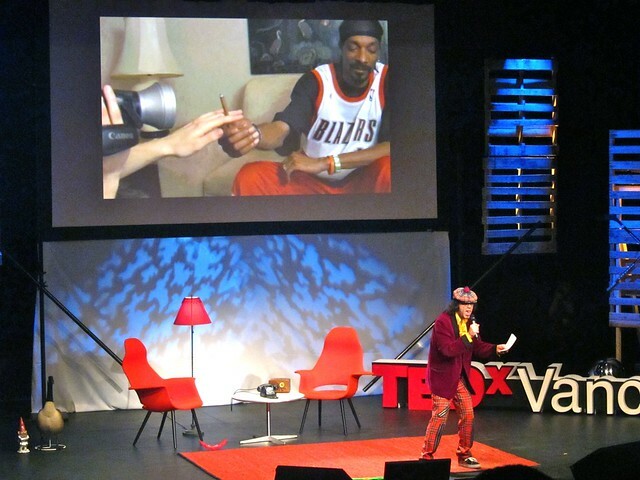 One of the undoubted highlights of the day was Nardwuar the Human Serviette's do it yourself speech on independent media and how he found success by just going out and doing things himself instead of waiting around. He talked about how he was able to interview the likes of Jean Chretien, Jay-Z, Snoop Dogg, Kurt Cobain, Lady Gaga, and others just because he asked. 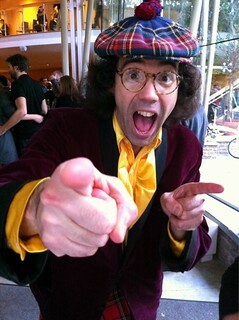 Nardwuar displayed his trademark enthusiasm and personality leaving the crowd in stitches with his intensely offbeat, hilarious antics. He even stage dived and surfed the crowd all the way to the back after his talk. Documentary filmmaker Josh Fox discussed his Sundance Film Festival Award-winning HBO documentary film, Gasland, about the dangers of the natural gas industry in the United States. 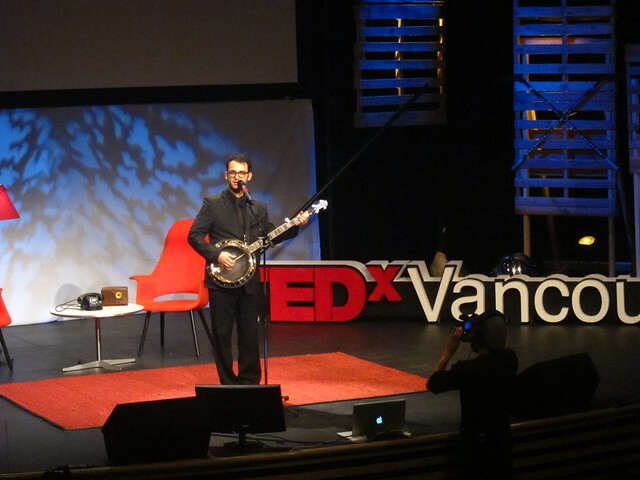 It was a stellar presentation accompanied by Fox himself on the banjo. He showed clips of the documentary including one of a homeowner being able to light his tap water on fire. 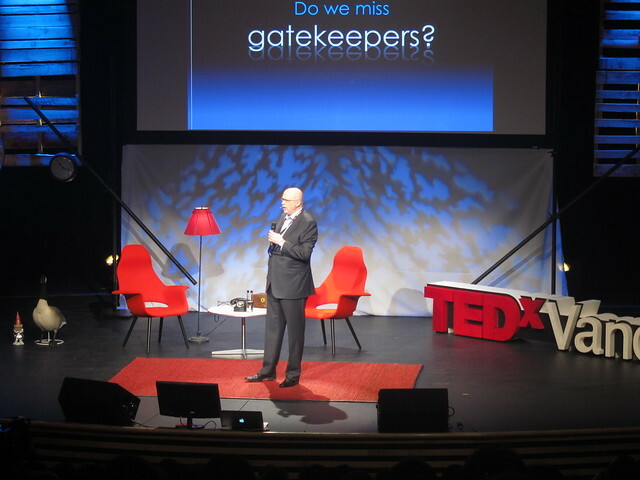 Fox received a standing ovation from the crowd for his compelling yet offbeat delivery on a very important topic. We met Fox at the after party and his talent for storytelling is clear. I must watch Gasland soon. Other highlights include Dr. Jack Horner's speech on "Shape-Shifting Dinosaurs: The Cause of a Premature Extinction". His presentation on the amalgamation of dinosaur groups was randomly hilarious in his basic execution with the mind frame of children's storytelling. Another highlight was Nicholas Molnar's talk about spaces and interactive games and tasks and how we respond differently to social networks and programs. 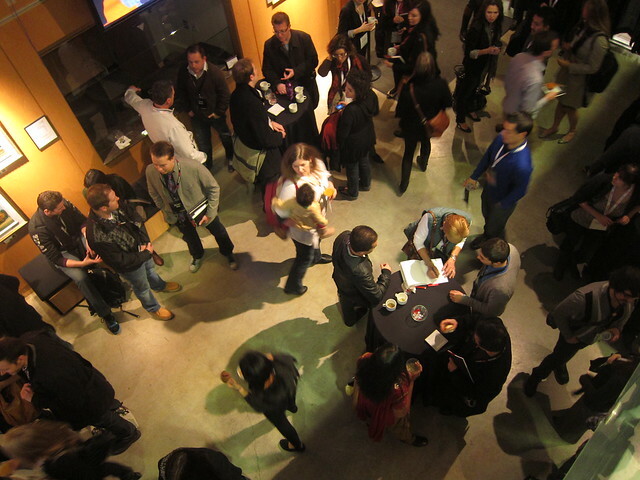 The after party at Mini Yaletown was a little disappointing only because the day was so great, but I still got to meet a lot of cool folks there, particularly many of the organizers, who finally got to relax a little. It was low key affair as only a fraction of the attendees were there. It is hard to blame them as everyone was pretty exhausted by the full day of events. 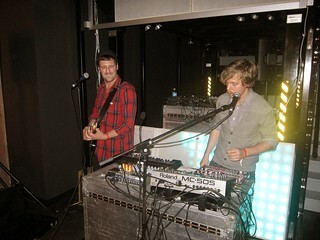 The musical duo Humans played and were very good. Their stripped down music was a real treat. Everyone spotted K-Os during the final minutes of the party which ended on a down note as the lights flipped on at 11pm with Genesis security asking people to file out. Thanks so much to the diverse group of speakers, performers, organizers, volunteers, and attendees for such an awesome day. I met some truly wonderful people and learned a lot like how nothing good happens at 4am and particularly how to properly castrate a lamb by biting its testicles off, courtesy of Mike Rowe from Discovery Channel's Dirty Jobs (below). 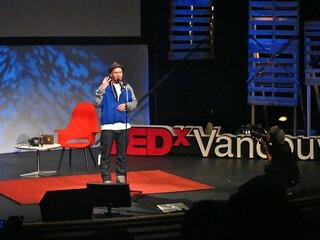 Update: I was quoted in Dave Olson's TEDxVancouver blog. 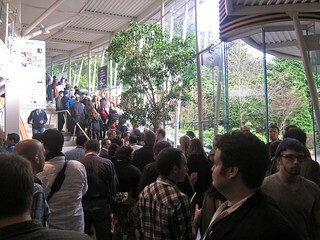 So nice to meet you at TEDxVan, great post. 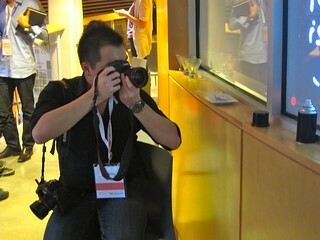 It encapsulates the event beautifully.